KIEV, Ukraine -- January 13 marks one month since Nadia Savchenko, the Ukrainian military pilot held in Russia, began her hunger strike. Detained Ukrainian pilot Nadia Savchenko stands inside the defendant's cage during her hearing in a Moscow court on November 11, 2014. Savchenko says she is determined to starve to death in pretrial detention if Russian authorities do not release her. "A person who was born free and not a slave in captivity cannot live in prison, especially if he or she is innocent," she wrote in a January 12 open letter shared by her lawyers. "I have given my word: 'Until the day I return to Ukraine, or until the last day of my life in Russia!' and I will not back down." Savchenko says she was illegally transferred to Russia in July after being captured by pro-Russian separatists in eastern Ukraine in June. Russian authorities, who claim the 33-year-old pilot was detained on Russian soil, have charged her with complicity in the deaths of two Russian journalists covering the conflict in eastern Ukraine. Under court orders, Savchenko spent one month at Moscow's notorious Serbsky Institute, a psychiatric facility known for helping authorities lock up dissidents during the Soviet era. Her hunger strike has raised fresh concerns for her well-being. In accordance with Russian law, she has since been placed in solitary confinement. 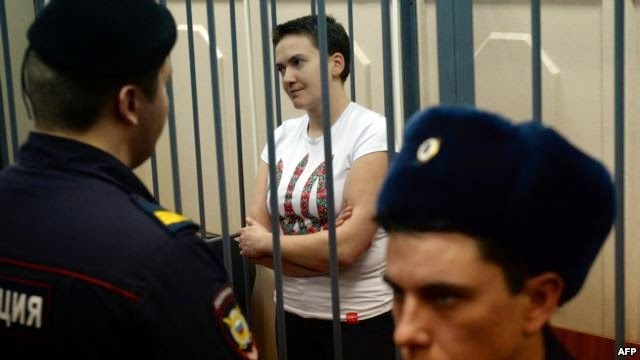 Savchenko, who ingests only warm water, has reportedly lost 10 kilograms (22.2 lbs) since starting her hunger strike. Prison officials recently gave her an intravenous glucose solution. "She doesn't look good," her lawyer, Mark Feigin, tweeted on January 13. Feigin was barred from visiting her through Russia's long winter holiday season, which ended on January 12. Anna Karetnikova, a Russian human rights campaigner, has already seen Savchenko twice this month. As the deputy head of Moscow's Public Oversight Commission, a state body that monitors the treatment of detainees, she has unrestricted access to the jailed Ukrainian pilot. According to Karetnikova, Savchenko's detention conditions are better than average for Russian prisons. She has not been brutalized or ill-treated in any way, although her letters have been withheld for over two months in violation of prison rules. But Karetnikova confirms that Savchenko is determined to die in prison unless she is released and allowed to return to Ukraine. "She rejects all demands and pleas for her to end her hunger strike, she says she will fast to the bitter end," Karetnikova says. "She's chosen her path and doesn't want to hear any advice on this topic." Savchenko's sister, Vera, says her sister's morale is still strong. "She's in good spirits, she's not broken or dejected," she says. "Sometimes she's down because life there is difficult. Solitary confinement is tough." Vera Savchenko says her sister's hunger strike should not be regarded as suicide. "It's her only available form of protest," she says. "It's a protest because she must be freed, because she is innocent. Ukraine has already provided all the possible proof as well as an ironclad alibi." While being concerned for her health, Savchenko's supporters say her hunger strike could actually succeed in persuading Moscow to free her in order to avert a political scandal. The air-force pilot is also a lawmaker with former Ukrainian Prime Minister Yulia Tymoshenko's Batkivshchyna party. Oleksiy Ryabchin, another Batkivshchyna lawmaker, says her deputy status is a major asset. "It helps a lot, of course," he says. "All the branches of power are also helping -- our president, who cares about her and mentions her in all his international speeches, and the Ukrainian parliament, and the entire [party] faction. Even the opposition unanimously voted to call for her release. The whole of Ukraine is united on this question." In addition, Savchenko has been chosen to represent Ukraine's parliament in the Parliamentary Assembly of the Council of Europe (PACE). An online petition by the U.S.-based organization Change.org is calling for her release and has gathered almost 700 signatures since being launched on January 12. A hashtag -- #FreeSavchenko -- was also created on Twitter to voice support. "Her case is heavily politicized," Russian activist Karetnikova says. "So maybe this is one of the rare cases when a hunger strike may actually work."